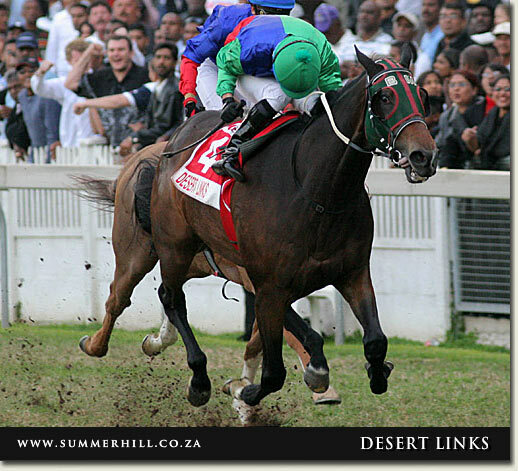 The 3200m Canon Gold Cup (Gr1) kicks off the new South African racing season on Saturday and it’s fitting that champion of the 2008 renewal, Desert Links, should embark on his Singapore campaign exactly a year from that historic day. On Sunday 2 August, the son of Kahalwill line up in the weight-for-age Group 3 $200,000 Jumbo Jet Trophy over 1400m, for trainer David Hill and jockey Mark Gallagher aboard. Thoroughbred News Singapore reports that David Hill is filling in as caretaker-trainer of Desert Links until Basil Marcus takes up his Singapore training post next year. David Hill and Basil Marcus have a long history together having teamed up in Hong Kong during the 1990’s, when Hill was in the training ranks and Marcus a leading jockey. Desert Links arrived from Dubai with trainer Herman Brown in May, when Jay Peg was in town to defend his Singapore Airlines International Cup crown. He was left behind for Basil Marcus to take over as trainer upon his arrival in Singapore. The gelding has been in David Hill’s yard just shy of two months and to date hasn’t been asked to do anything too strenuous, although he did catch the eye with a good second in a 1000m trial on July 21. David Hill said he was quite taken with Desert Links who is a seven time winner in South Africa including two wins at “black type” level. Following Sunday’s race, David Hill said he would look at stepping Desert Links up in distance in an effort to get him to his ultimate goal, the Group 1 Singapore Gold Cup over 2200m in November. He explained that Desert Links would target the new “Classic” races aimed at getting more stayers into Singapore. Desert Links is a five-year-old by Kahal from the Home Guard mare Selborne Park. He arrived in Singapore with a rating of 97 and has raced on 22 occasions in South Africa and Dubai, registering seven wins and a further three second placings over distances of 1600m up to 3200m. New Zealand Bloodstock reports that the 2008 New Zealand Ready To Run Sale of two-year-olds which ended yesterday at Karaka, achieved solid results which largely defied the international financial crisis. Both the sale median and average were only a shade off last year’s figures, with the median price reaching $60,366 (down just 1% from a record $61,134 in 2007) and the average $33,000 (down 8% from $36,000 in 2007). The clearance rate climbed steadily throughout the day to finish at 67%, down from last year’s 70%, with 247 horses sold for $14,910,500, compared with $15,100,000 for the same number sold last year. Tuesday’s top price of $400,000 for the Red Ransom colt from Lady Circles was not surpassed, with yesterday’s top lot knocked down for $360,000. The Zabeel colt from group one winner Surprize was purchased by Queensland bloodstock agent John Foote from Mark and Shelley Treweek’s Lyndhurst Farm. “I’ve bought him for a Hong Kong client and as yet we haven’t decided whether he’ll race in Australia first or go straight to Hong Kong,” said John Foote last night. The Zabeel colt breezed up the 200m straight at Te Rapa racecourse on 20 October in a time of 11.72 seconds. Of the 247 horses sold, 17 fetched $200,000 or more compared with 14 last year, showing the relative strength at the top of the market. New Zealand Bloodstock’s sales and marketing manager Petrea Vela was very pleased with the results after uncertainty created by the financial crisis. “In view of the challenges facing everyone in the current market conditions, the results of the past two days have really been well in excess of our expectations,” she said last night. Leading the buyers was transtasman trainer Graeme Rogerson with eight horses purchased for $1,625,000. 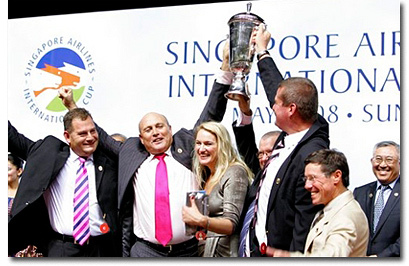 A total of 49 horses are destined for Singapore, including purchases by former Kiwi trainer Laurie Laxon, Michael Freedman, Stephen Gray and Soon Hock Lee, with another 18 bought for Hong Kong. Fourteen headed to Malaysia and five to Macau. The Seoul Racehorse Owners Association bought a further six yesterday to bring its total to 16 horses now bound for Korea. The leading vendor for the second year in a row was Mark and Shelley Treweek’s Lyndhurst Farm, with 11 of its 15 entries selling for $1,706,000 at an average of $155,091. There were two issues surrounding Jay Peg’s performance in the $ 3 million Singapore Airlines Cup (Gr.1) on Sunday. The first concerned the merit of his win in the $5 million Dubai Duty Free (Gr.1) at the World Cup meeting in March, and whether or not that was something of a fluke. 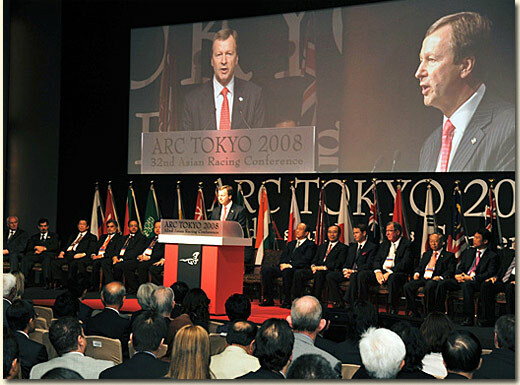 And the second involved the question of his “nationality” going into Sunday’s big event. As far as the first question is concerned, his convincing 2.5 length victory on Sunday left his doubters in no doubt at all about his merit, particularly as the field included one that had run second to Archipenko in last month’s Queen Elizabeth Cup (Gr.1) in Hong Kong, as well as at least one quality Australian performer with Group One form. In a race in which the pace was on at one helluva lick from the off, Jay Peg stalked the leader at a distance of some six lengths, and then, about 600 m about home, Anton Marcus let the reins out a notch, and whoosh! he was away. The harder they came from behind, the harder Jay Peg went, and he hit the line at a growing distance of more than two lengths, much to the joy of a not insignificant contingent of South African connections. We mention his South African connections because there was some consternation before the race at a suggestion that he be entered as a representative of the United Arab Emirates, where he has been based since his departure from South Africa. Of course, he is South African-bred, South African owned, South African-trained, and he was South African mounted on Sunday, and there was nothing other than his preparation to suggest that he belonged anywhere else, so it was with some relief that racing fans in this country found they had a live candidate in the race. The ecstasy in the grandstands was palpable, as Marsh Shirtliff, Etienne Braun, Paul Loomes and Selwyn Marcus embraced each other in a rare display of unbridled emotion, while one had to acknowledge the professionals involved in this horse’s career to date. It was an all-Marcus affair, with brother Basil Marcus having selected the horse as a yearling and trained him while he was involved in the domestic programme at home, brother Anton Marcus was abroad and brother Selwyn Marcus was among the owners. In sending the horse to Herman Brown Jnr for his Dubai and Singapore campaigns, the Marcus family were acknowledging a decades-long relationship between them and the Browns, when young Basil, (as he was then), was stable jockey to Herman Brown Snr in one of the most successful partnerships in racing history. The son of Camden Park was bred and raised at Ken Truter and David Hepburn-Brown’s High Season Stud near Hermanus, and was a R140 000 yearling of his year, a far cry from the well over R40 million he has since earned at the races. The entire Summerhill and Vuma teams salutes the achievements of this grand horse, who once again did the nation proud. From one champion team to another, we extend our warmest congratulations.